TIKKA T3X 6.5CM VARMINT SS 5RD MAG 23.7"BBL - Corlane Sporting Goods Ltd. The Tikka T3x Varmint Stainless is perfect for those looking for a true stalking or long distance tool. The Stainless model has the metal parts made of Sako's high-grade stainless steel. This is a sturdy and long-lasting choice for all weather conditions. 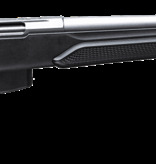 The T3x Varmint Stainless comes equipped with the T3x synthetic stock with an extra wide fore-end for benchrest shooting and an ergonomically designed cheek piece. The stock still includes all of the modular features and comes with a vertical pistol grip suited for shooting in a prone position.